It’s rare that the same thing that makes me exclaim “I HAVE to see this for myself!” inspires Henk to say the same thing. 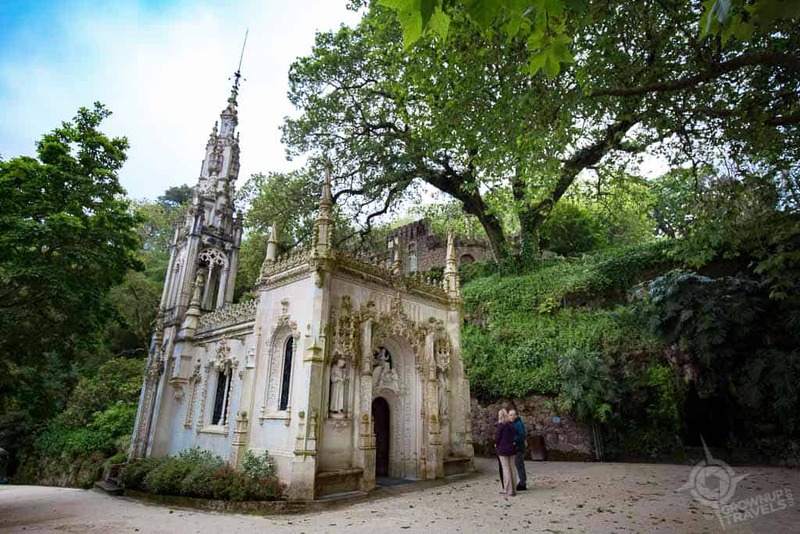 But that’s what happened when we both saw photos of the Quinta da Regaleira ‘Initiation Well’ in Sintra, Portugal. What was even more surprising is that we were both so impressed with this marvel and the estate where it is located that we visited it twice in the same trip. Here’s why. Anytime I hear about any place that is linked to – or is rumoured to be linked to – the Templar Knights, the Masons, or anything else in the realm of Christian mythology, I’m in. Not because I’m particularly Christian, but because I love a good mystery, especially one that involves quests. 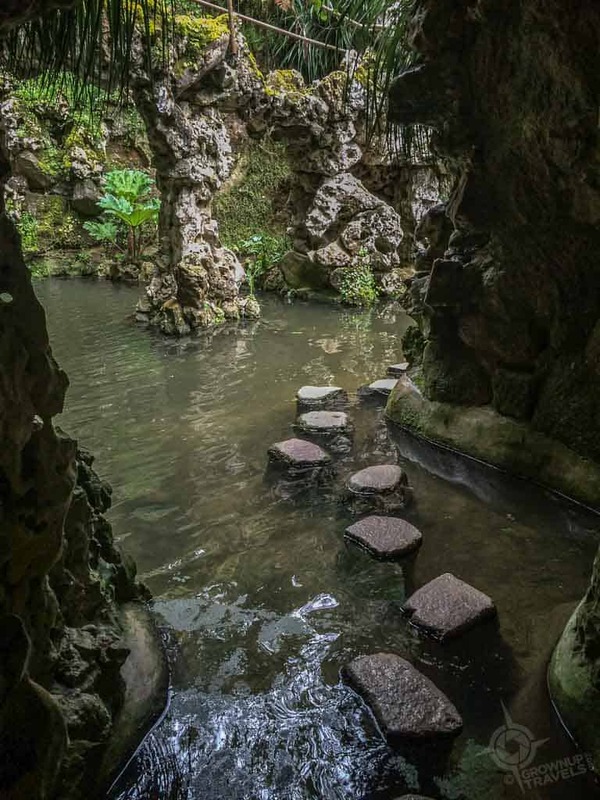 And in many ways, a quest is what Quinta da Regaleira is all about. But although there are only a few rumours and architectural references relating to the Templars, and none that suggest there is a holy grail on this property, there IS a quest that visitors to these gardens embark upon (more on this later). But first, the palace! I’m no minimalist, I’ve discovered. The more embellishment and decoration there is on a building, the more I seem to like it. And the palace at Quinta da Regaleira delivers all of that and more. 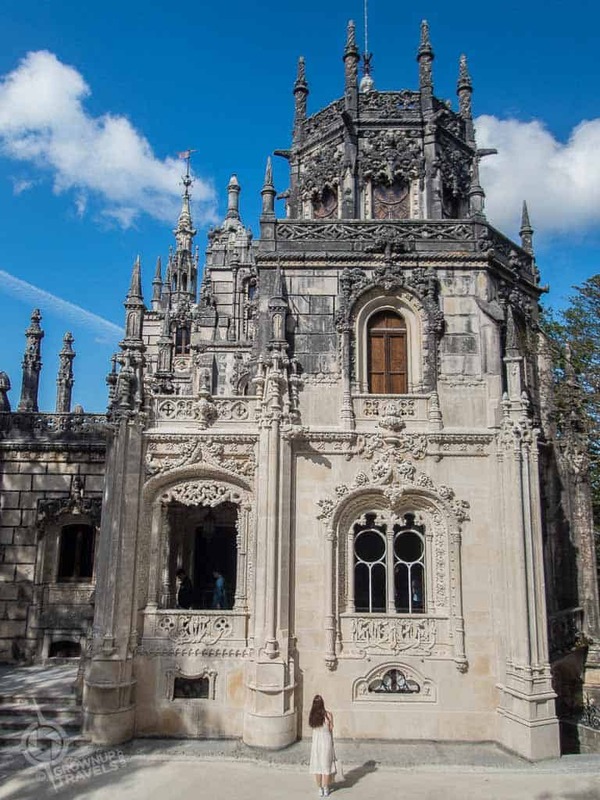 Even though it is not the most historic palace in Sintra, (where you can’t throw a stone without hitting a King’s residence of one sort or another), it is one of the most visually elaborate. 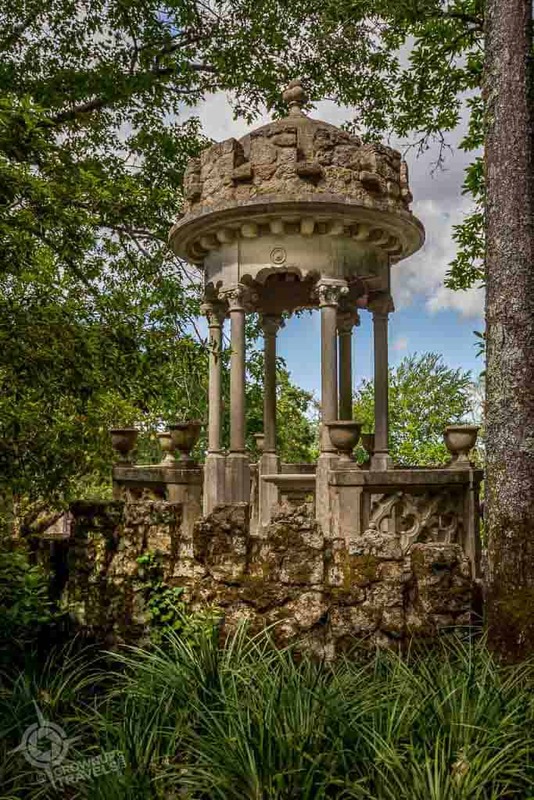 Built in the late 19th and early 20th centuries by Antonio Augusto de Carvalho Monteiro, a wealthy ‘Brazilian-aire’, Quinta da Regaleira was an expression of the owner’s own love for Romantic gardens and neo-manueline architecture. 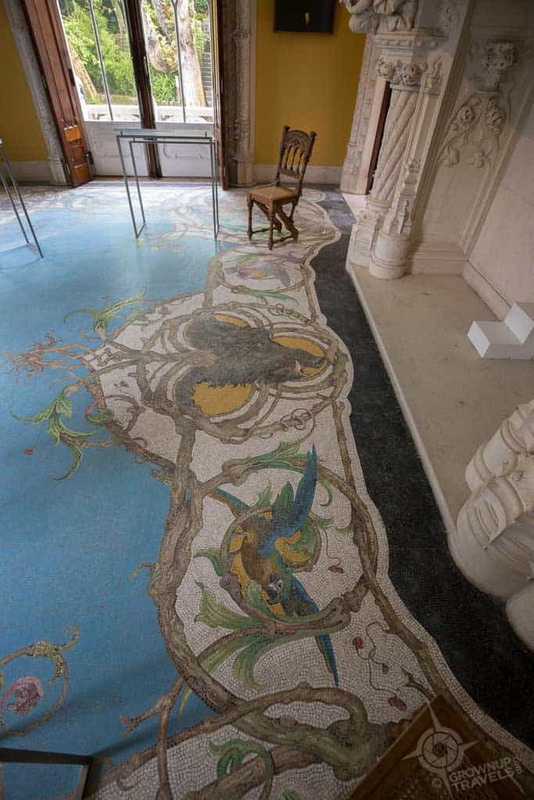 His Italian architect, Luigi Manini, was equally mad for both, and it shows in both the palace and the grounds of this 10- acre estate that he designed. 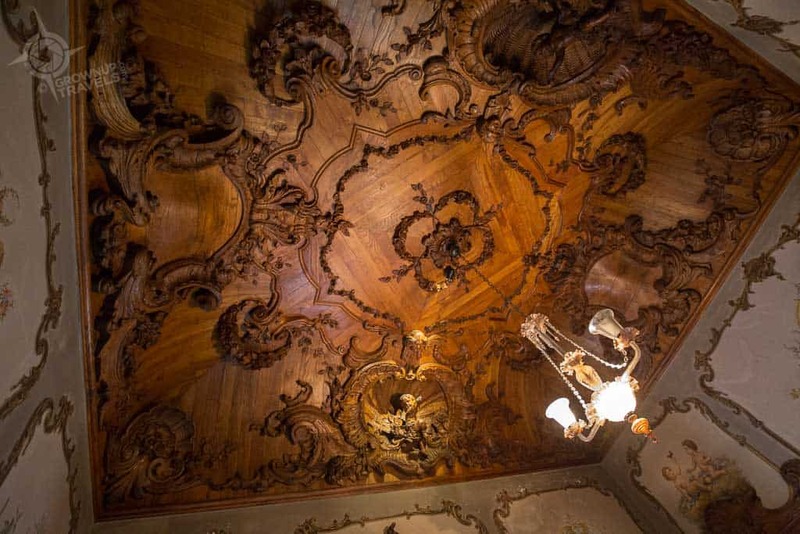 Known for his set designs at La Scala in Milan where he worked, Manini poured the same kind of operatic drama into both the palace and the chapel that are built on the estate. Decorative arches, swirls, pillared windows, ornate columns, gargoyles and turrets are everywhere, as are stained glass, inlaid wood ceilings and mosaic floors. Here and in the little chapel not far from the main house, there’s no such thing as ‘too much’. 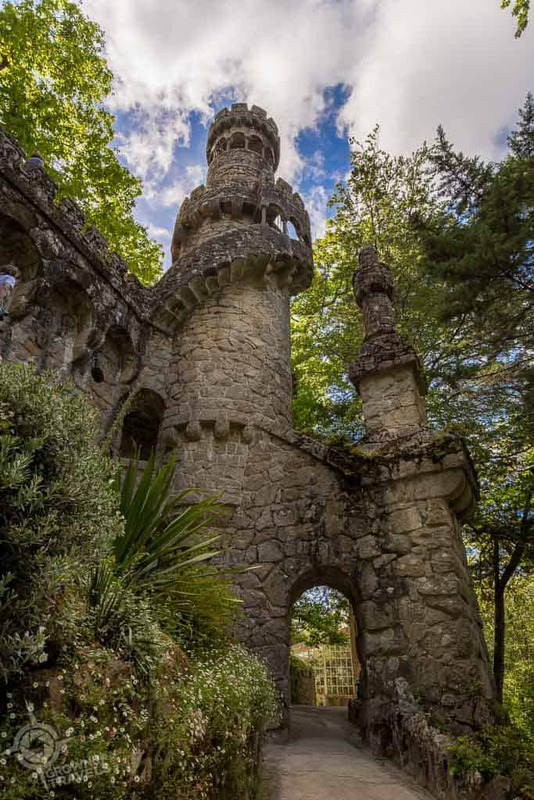 It is on the grounds and elaborate gardens of the estate where the real magic of Quinta da Regaleira lies. A true Romantic garden, the design of these pathways and structures and the symbols and ornaments found within it, are all part of an allegorical journey that each visitor experiences in their quest to ‘know thyself’. Romantic structures are found throughout the gardens. At the centre of this quest is the spectacular ‘Initiation Well’, a ‘subterranean tower’ that sinks over 100 feet into the ground, and acts as a vertical “bridge” between the depths of the earth and Heaven above. Visitors descend the 9 levels of the well on a spiral staircase that takes you on a symbolic journey deep into your inner self, where only by exploring your darkest truths can you be redeemed into the light, mirroring other literary references like the ones you’ll find in Dante’s Inferno, which had 9 levels of Hell. Standing at the centre of this incredible vertical passageway, even with other visitors around, you do feel a sense of isolation from the world so far above the moss-covered stairway. Walking on water is part of the journey into light. Henk and I didn’t have nearly enough time to explore all of Quinta da Regaleira on our first visit, and it obviously left us both wanting more – because two weeks later, on our way back to Lisbon before flying home to Toronto, we took an unplanned detour so that we could pay this magical place another visit. 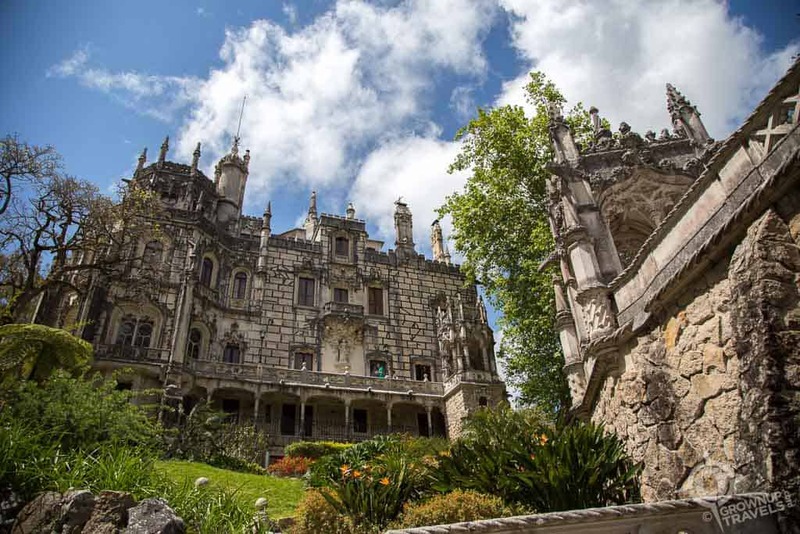 It’s not often that a place or event lives up to your expectations, but Quinta da Regaleira is one of those places. Like the town of Sintra itself, there’s so much here one visit just isn’t enough. 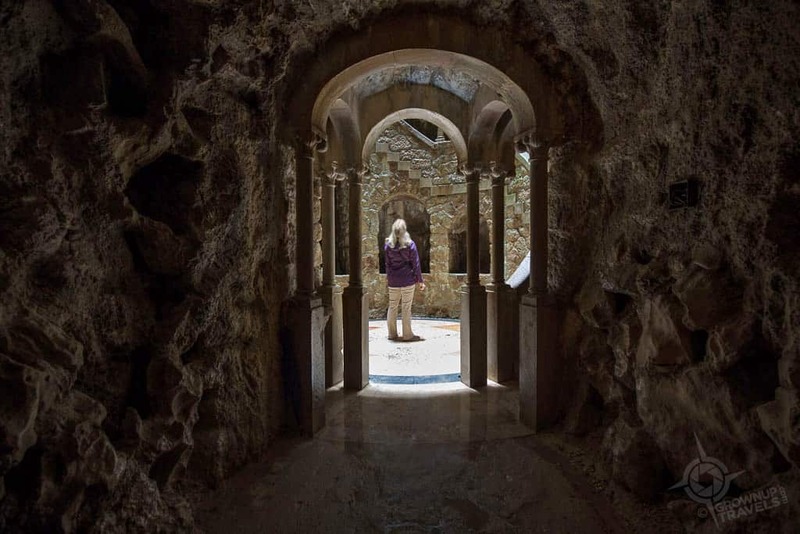 TIP: To get the most out of your visit to Quinta da Regaleira, allow at least a half day. Explore the grounds on your own self-guided tour (admission is 6 Euros), or consider a guided tour (worth the extra 4 Euros you’ll pay for the insights and history). Oh my word! 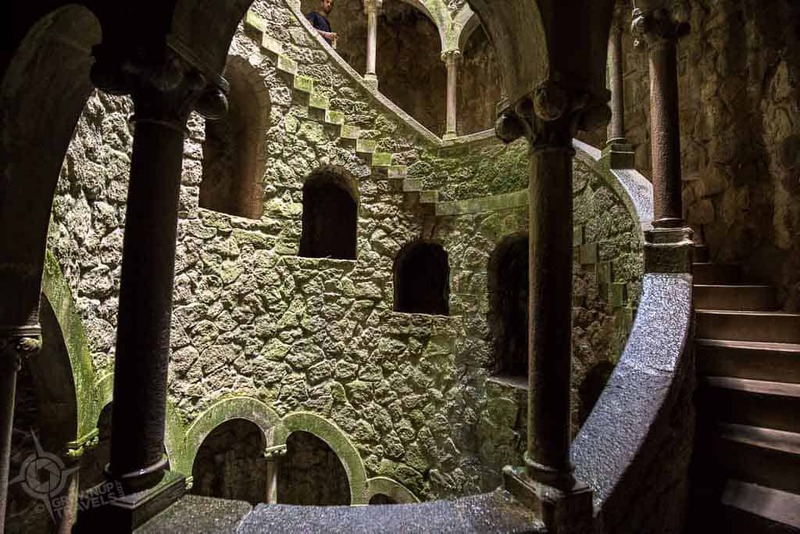 Game of Thrones has nothing on Quinta da Regaleira, Sintra! The architecture is magical and anything that involves labyrinths, tunnels, lagoons and waterfalls get back into the light has me hooked. Going on my bucket list!!! Wow, that top picture is one of the coolest photos ever! Almost as cool looking up from the bottom though. 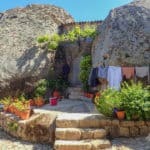 I agree – the Well was unbelievable from every angle, and it was quite difficult to capture in photos just how magical it was. It was one of the reasons Henk and I went back (and then on our second visit because we had more time, we discovered that there is a smaller, unfinished Well on the same property, though this one is much grander). Definitely a must-see! I have to see this for myself! 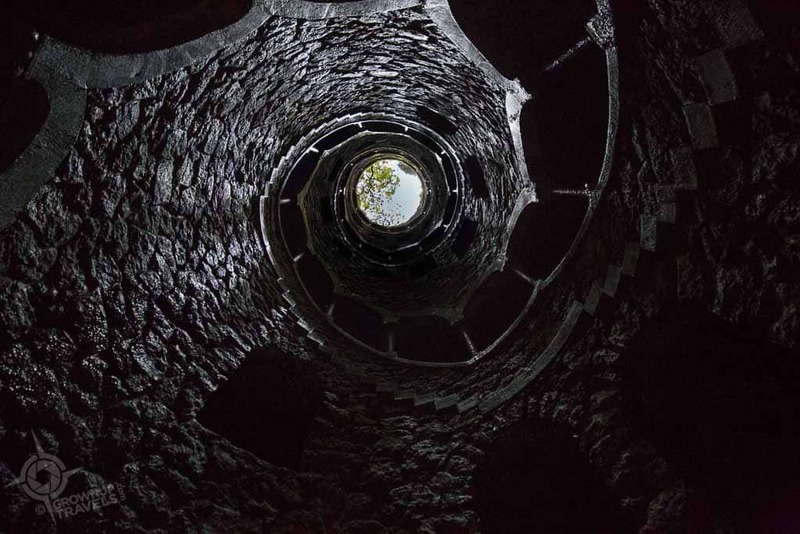 What a beautiful place is the Initiation Well’ at Quinta da Regaleira in Sintra. Reading this we were discussing immidiately our first visit to Portugal aiming for Spring next year. Wow, that would be awesome! 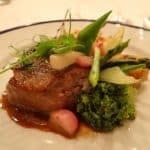 Definitely would recommend you put this on your itinerary, Marcelle! 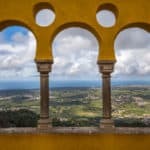 We were in Sintra for 2 days to see all of the palaces, and that still wasn’t enough time to do it all justice! 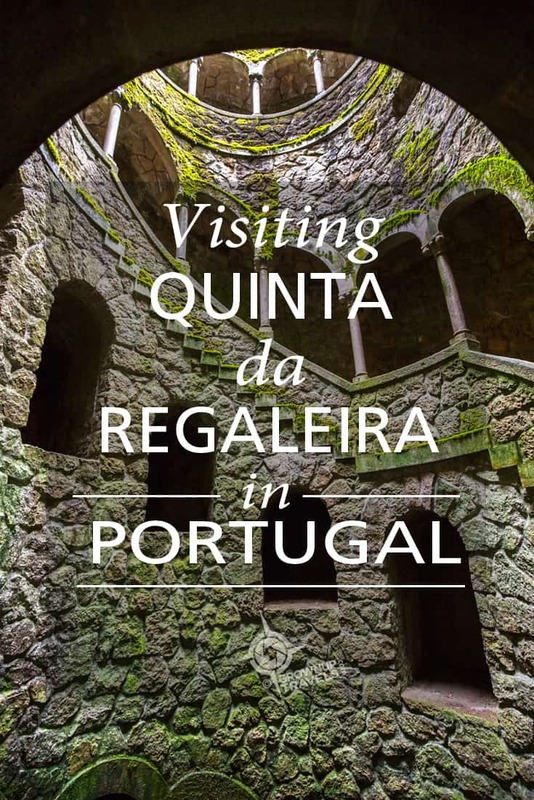 I can’t believe that I went to Sintra and missed the Quinta da Regaleira. 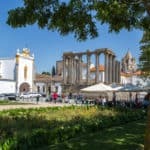 It looks fabulous, but then Portugal is full of amazing places like this. Well, that means you’ll just have to go back! 🙂 Seriously, there’s so much to see in Sintra that you couldn’t see it all if you only had limited time. The place is lousy with palaces! How fascinating! I also love a good quest, squiggly architecture, a hint of mystery and a great story – which this was! I know there is a lot of symbolism in the gardens, but even without knowing a thing about that, this place was pure magic! 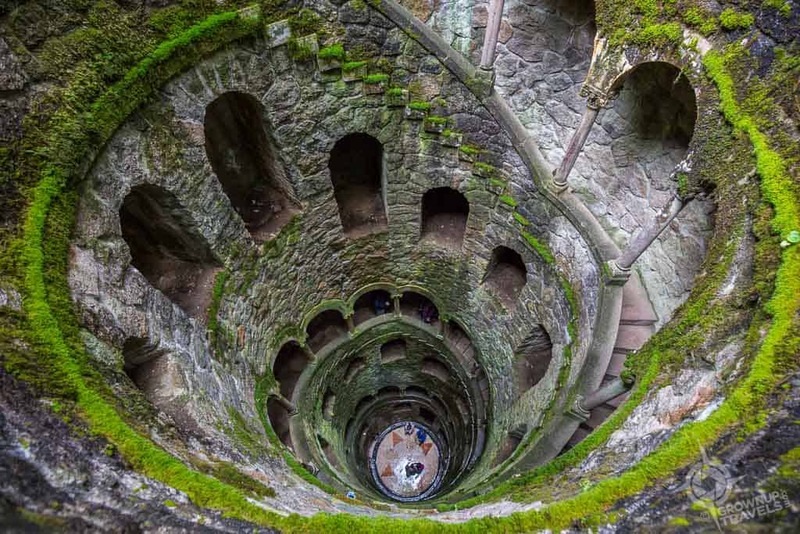 Oh my goodness – this Initiation Well looks like something right out of Game of Thrones. It’s beautiful! 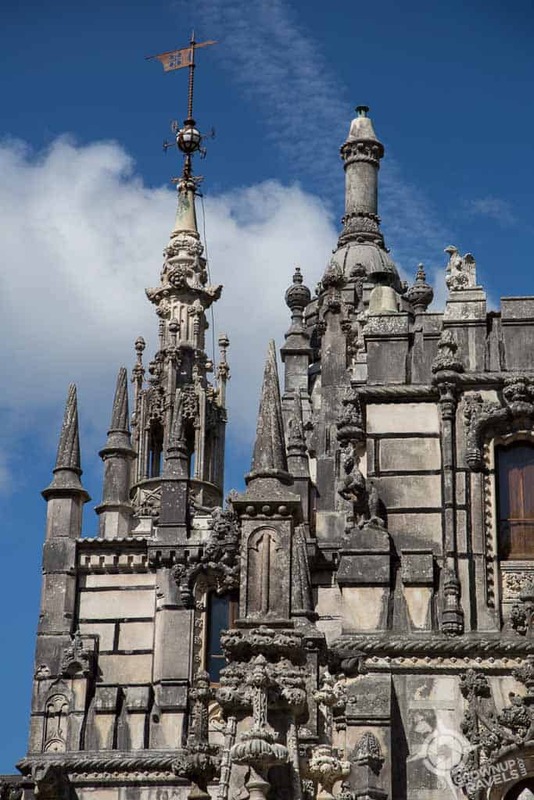 Which is the nearest major town to Quinta da Regaleira or Sintra? Would it be Porto or Lisbon? Honestly, this Well was one of the first inspirations that drew me to Portugal! And it did not disappoint! Sintra is the town where Quinta is located, and it is actually within walking distance of the train station. There are trains from Lisbon (45 minutes) that come here just about every hour. Porto would be about 3 hours away.